We finally have spring in Tbilisi. After a March of absolute garbage weather, it’s actually warm enough to open our windows and enjoy the fresh air. Every week in March, Sean and I would look at the forecast, look at each other, and say “I’m sure next week it will finally be nice.” Yeah. That never happened, until this past weekend. By unfortunate coincidence and improper planning, we spent several hours on one of the first warm days of 2019 inside a completely enclosed sulfur bathhouse. 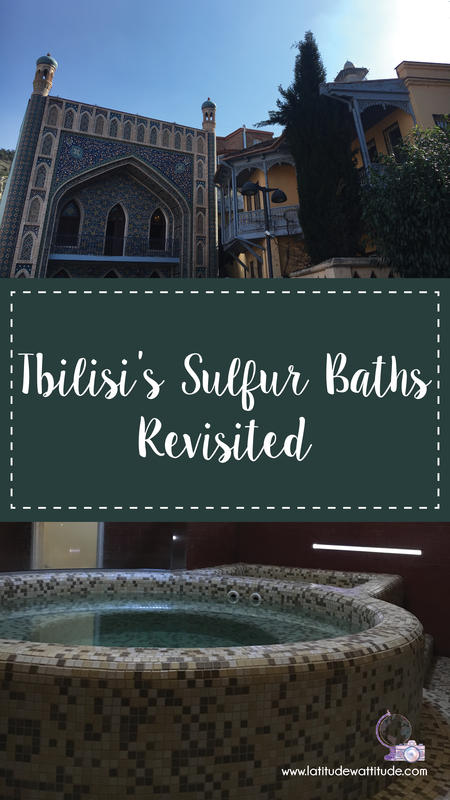 We had meant to go to the sulfur baths the previous weekend when it was still cold, windy, and rainy, but by the time we tried to make reservations they were completely booked. Not surprising given the weather. Sean hadn’t been to the baths yet, and I wanted him to experience Georgia’s unique brand of relaxation before summer rolls around and it gets too hot to even think about soaking in 42-degree (Celcius) water. 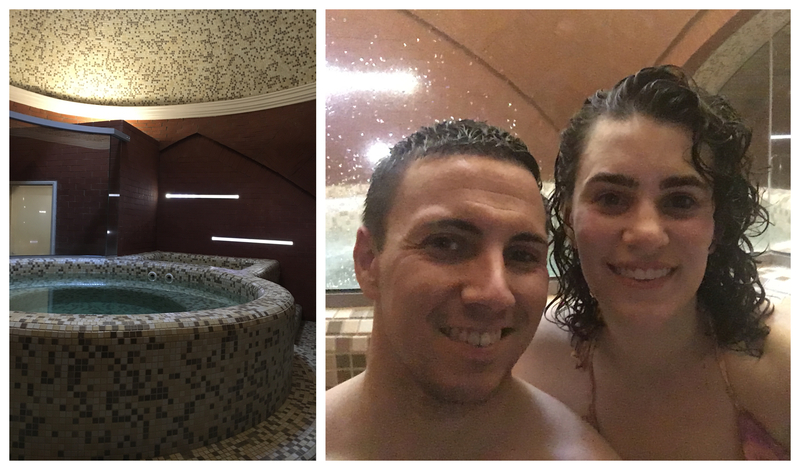 I had previously visited the Royal Bath sulfur bathhouse in January, so I was excited to give a different place a try. It seemed everyone we talked to recommended Chreli Abano, aka “the one that looks like a blue mosque,” so we decided to give it a go. Making reservations online via email was easy, but I know we could have called as well. The staff speaks English, and the reservation system is electronic so I have faith your booking won’t be lost or not recorded. Chreli Abano has a wide variety of rooms for a wide variety of prices. Some of the cheaper rooms have simply a hot sulfur pool and nothing else, others, like ours, had hot and cold pools, a sauna, showers, and a rest area. The largest and most expensive room has hot and cold baths, a Finnish sauna, Turkish sauna, rest area, private bar, massage area, and an optional “snow room.” I’m not sure I’m willing to pay 500 GEL an hour just to see what a “snow room” is, but I am definitely intrigued. We chose N1 for our room, and it was very beautifully decorated in stone mosaic and brick. Filtered light streamed in through the chimney in the top which gave off a very tranquil vibe. It was considerably smaller than the room we had at Royal Bath, but I’d say more visually appealing. Space was maximized with the star of the room being the large circular hot sulfur bath in the center. We opted out of the massage this time, but did take advantage of their bar service and enjoyed cocktails during our soak. 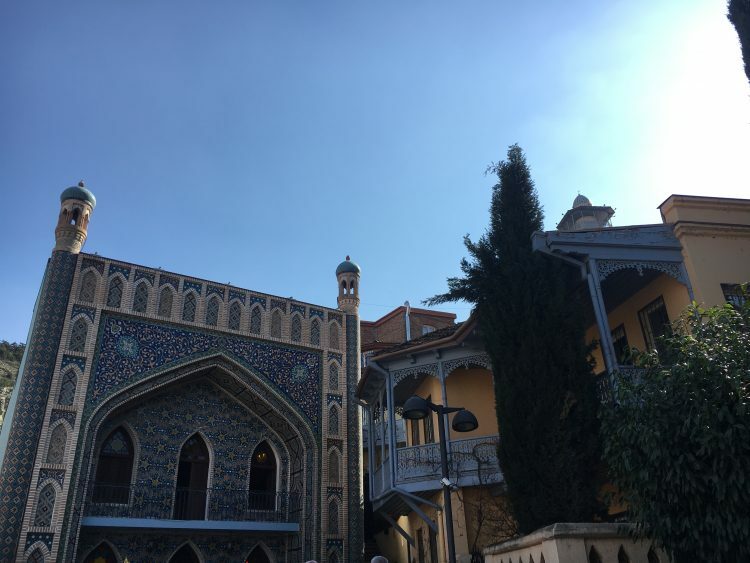 I do appreciate how Georgia does sulfur baths – private rooms are just way more comfortable than public bathhouses with a bunch of strangers. It was a very relaxing and enjoyable experience. I’m sure we will be back again as soon as the weather takes a turn for the worse. Next week is not looking promising for maintaining warm temperatures, unfortunately. It is still spring after all.